As of October 14, 2014, Cable Bahamas Ltd. became a VAT Registrant and is authorised to charge and collect VAT on behalf of The Government of The Bahamas. 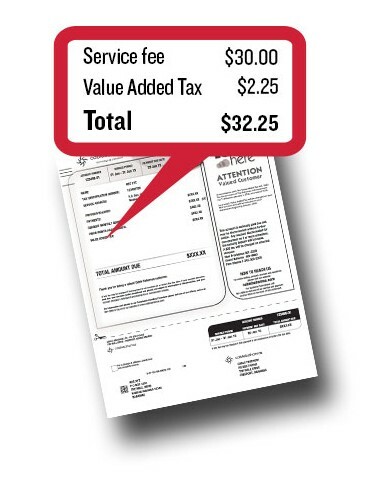 Effective January 1, 2015 VAT will be charged at a rate of 7.5% on all REV services. As a result, VAT will be included on your statements beginning January 2015. You will be required to pay your bill in full inclusive of the VAT. As mandated by law the Tax Identification Number must be displayed on all invoices and bills remitted by a VAT Registrant. The provision of a VAT Registrant’s Tax Identification Number will permit Cable Bahamas to include the same on all bills and invoices sent to customers. Cable Bahamas Ltd. appreciates the cooperation of its customers as it seeks to comply with the VAT Legislation.